This colorful one-pot pasta is fast, simple, and satisfying. Let the rigatoni cook while you prep the rest. Then, set aside the al dente pasta to sauté the garlic, chicken, and veggies—quick-cooked to a tender-crisp finish. 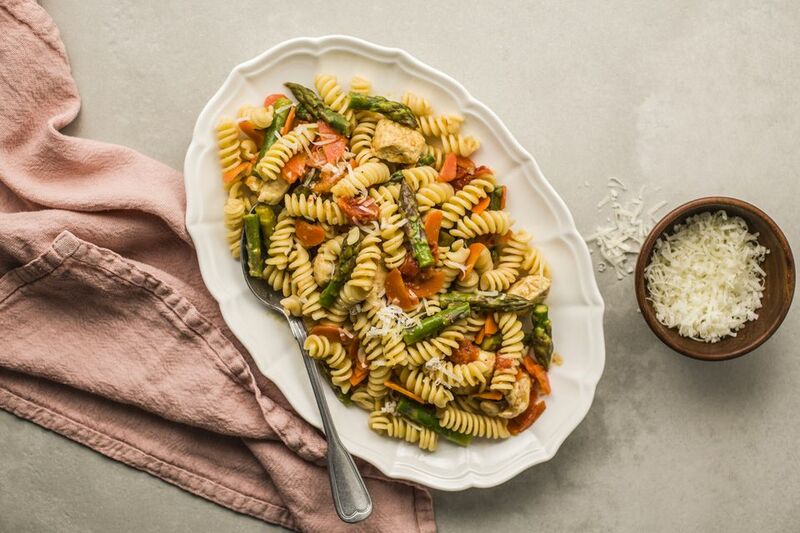 Tossed together with grated Parmesan cheese, it’s both balanced and comforting. Heat oil in a large pot over medium-high heat. Add garlic and cook until golden and fragrant. Add asparagus, tomatoes, carrots, salt, and pepper. Cook until asparagus and carrots are softened and cooked. Add pasta and parmesan. Stir to combine and melt cheese. Add more salt and pepper to taste.